Thermablok Inc., a NASA Spinoff listed company, is a winner in the 2016 Money-Saving Product competition sponsored by Buildings Media. Thermablok is featured in the 2016 Money-Saving Product-Envelope Enhancements section of the publication. “We hope now architects, contractors and other building industry professionals will learn more about Thermablok aerogel technology and its benefits over standard fiberglass insulation, said Lahnie Johnson, president and founder. Thermablok Inc., a NASA Spinoff listed company, is a winner in the 2016 Money-Saving Product competition sponsored by Buildings Media. Thermablok is featured in the 2016 Money-Saving Product-Envelope Enhancements section of the publication. Finalists were evaluated by the BUILDINGS editorial staff for the money-saving qualities they offer to building owners and facility managers in areas such as energy efficiency, water savings, and maintenance. It is estimated that as much as 50% of the energy we consume in the U.S. is used to control the temperature in buildings. Of that, the major percentage escapes through walls and windows in a process termed THERMAL BRIDGING. This has always been a significant known problem. Until the introduction of NASA technology AEROGEL, there has never been any insulation that could go between a metal stud and the drywall or outside sheeting that would not compress during installation, thus losing its insulation properties. NASA technology AEROGEL is not only the highest insulating material known, but also has the least amount of compressibility of any known insulation. It is used in the most extreme thermal environments, space suits, the Mars missions, space shuttles, the Star Catcher mission, and clothing now used on Mount Everest expeditions. Adding just one THERMABLOK AEROGEL STRIP approx. 0.25" x 1.5", to only one side of each stud can increase the “R” value of a wall (regardless of insulation in the cavity) by an amazing 30 to 40% (DOE Oak Ridge laboratory test). Used by the military, NASA, Apple, Google, Stantec, Siemens, Kiewit, Turner, Clark to name a few; this is without question THE ultimate breakthrough in insulation technology. Considered revolutionary, Thermablok Aerogel Strips are featured in NASA Space Shuttle Enterprise Exhibit at the popular Intrepid Sea, Air & Space Museum in New York City. “We’re proud to have Thermablok Aerogel Strips chosen as a winner in the 2016 Money-Saving Product competition sponsored by Buildings Media. It’s great for people to see how entrepreneurs can take a technology and innovate it into something that can help people have a better quality of life and save them money,” Lahnie Johnson, president and founder said. “We hope now architects, contractors and other building industry professionals will learn more about aerogel technology and its benefits over standard fiberglass insulation, and that Thermablok will become a new standard in green design and construction for preventing energy from leaking out of the building envelope," Johnson concluded. Even in small home applications research indicates that using Thermablok Aerogel Strips can provide energy savings of up to approx. $746 per yr. (in an average home of 2400 ft.² and a reduction of 3.9 tons of CO2 emissions). Relative to tax incentives/energy costs one could recover the entire cost in two to three years. It may also be used in many other applications including radiant flooring, concrete slab separation, underground concrete and water pipe insulation and literally hundreds of other applications as the material is hydrophobic. Metal buildings can have a significant energy efficiency increase with Thermablok Aerogel Strips in the wall and the metal roofing. Using Acoustiblok® sound insulation with Thermablok resolves many high temperature noise problems ie; exhaust systems, hot pipe noise, and industrial noise. Thermablok Inc. is owned by Tampa entrepreneur Lahnie Johnson, who is also the president and founder of Acoustiblok Inc., a leading soundproofing manufacturer and seller. After extensive research and testing, Johnson, a veteran of the aerospace industry himself, developed Thermablok Aerogel Strips to combat the significant problem known as “thermal bridging”. NASA named Thermablok aerogel insulating material to its prestigious "Spinoff" list of companies that have successfully adapted NASA technology to everyday products and made them available to consumers. Just one, 1/4-inch x 1½-inch (10mm x 38mm) strip of Thermablok Aerogel insulation applied to the edge of each stud before hanging drywall breaks the conductive "thermal bridging" and can increase the overall wall R-factor by more than 30 to 40 percent (US Department of Energy/JM Laboratories). Thermablok is most often used in construction as a preventative measure against thermal bridging. 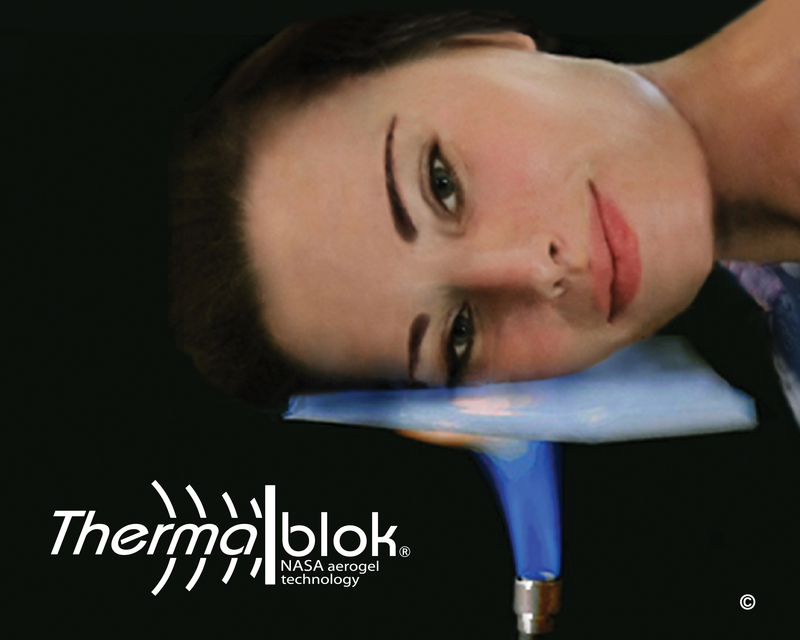 For more information: http://www.thermablok.com.